Suzanne Orr visited Giralang Primary School, which is one of 52 schools that will benefit from the ACT Government’s investment. Photo: Supplied. The ACT Government will spend $2 million to install new street signs, wayfinding pavement stencils, new footpaths, safer crossings, traffic calming measures and additional bike storages to encourage more kids to walk or ride to school next year. More than 50 schools across the nation’s capital will join the ACT Government’s Active Streets for Schools program, which gives schools the resources and infrastructure to encourage more students to walk, ride or use public transport. Suzanne Orr, representing the ACT Transport Minister Meegan Fitzharris and Education Minister Yvette Berry, said the first year of the Active Streets saw a five per cent increase in the number of children who walked or rode to and from school. The Active Streets program goes hand-in-hand with the Ride or Walk to School program which supports schools to build the confidence and skills of students to actively travel to school. “The great thing about this program is that we work with the schools to tailor the infrastructure improvements to suit each school’s individual needs and help address potential barriers preventing walking or riding to school,” said Ms Orr. My son had his bike stolen along with four other bikes at the schools bike compound three weeks ago.. Looking at many of the parents when I drop off the kids at school, they need walking to work options too. How do our kids like being told to be “heathy” with their exercise and eating options when so many adults are in the weight range that is medically obese? People need to love them self more, eat better and find the time to exercise. Canberra has so many open spaces with one of the most livable city rankings, but still so many obese people who can’t enjoy it! It makes me sad. Yeah right. With so many school closures , not all kids can walk to school. I’m in Chifley, we are in the intake area for Torrens. 4km. Yep. Great little walk each day. NOT! Depends on the age of the children, but bikes might be the answer. It's not the kids that need encouraging. It's the parents who worry about paths, lights, crossings, company, and a safe route to travel. Is that because the Government wants to get rid of the school buses? 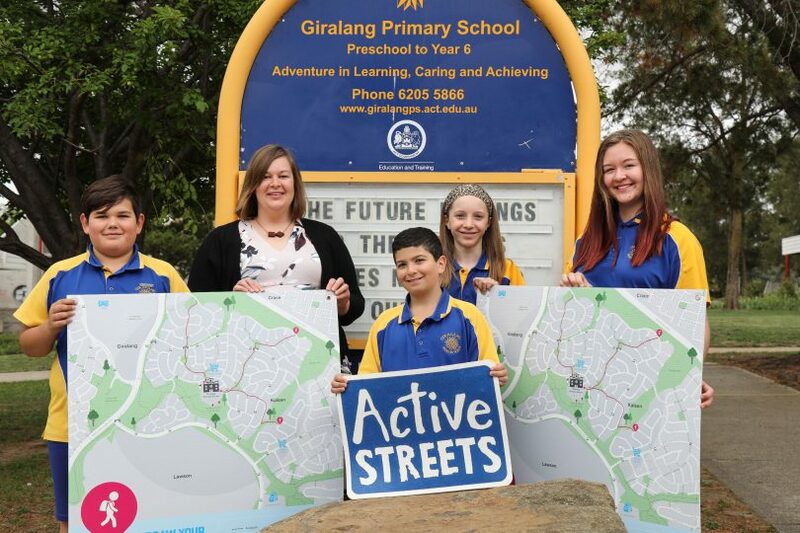 Giralang is a great suburb for kids to get to school safely. From my house they don't have to cross a single road due to underpasses. I wish other newer suburbs did similar. Let’s hope they do a better job than they did at Ainslie School, where the Active Streets signs bring you directly across the road from the school and then terminate, with no crossing. Someone didn’t use their brain with that one. It doesn’t help that on the other side the Limestone Ave traffic lights are timed very poorly for morning traffic - school kids are usually pretty good at waiting, but the adults walking to work don’t set them a good example. Not sure it's the kids you need to encourage....its the parents who are paranoid little Mary or little Johnny will be nabbed, get lost, run over or worse still, might just enjoy it. Instead of an ACTION Bus! I for one was forced to walk to school and I am against it. So was I, which I am grateful for. It showed me how normal and easy this is. I had the chance several times to walk through snow to school too, which was so much fun. Found pretty stones in the gravel, admired flowers; none of which would have happened if I had been wrapped in cotton wool and these opportunities stolen and I was driven to school. We either walked or biked. Loved it.